I suppose it is because I am generally seen here to be a sort of internet geek, that people are often surprised to find that I am in actual fact a ‘Silver Surfer’. So I was very pleased recently to be invited to be interviewed on a local community radio show to talk about older people and the internet. ‘At Home This Morning’ is a 55 minute magazine radio programme of items of interest to older listeners. A team of twelve enthusiastic volunteers who collectively comprise ‘Grey Matters Productions’ is responsible for the programming. The show is broadcast from their first class recording studio which was equipped with a grant from ‘Awards for All’. 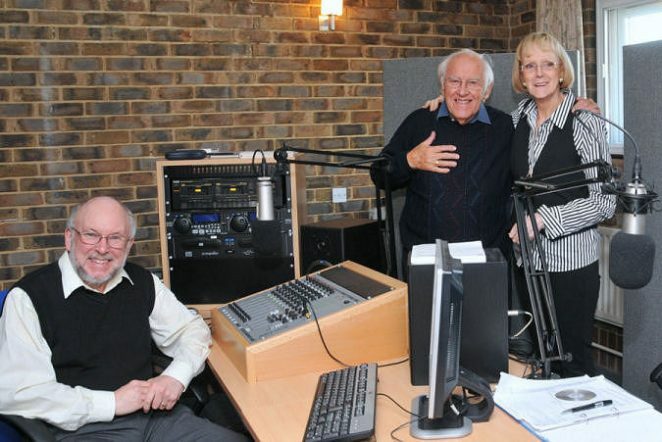 The radio shows are produced and presented by former BBC man Richard Davis, on local community station Radio Reverb, which can be found on 97.2FM. You can also catch the programme on the internet via an mp3 stream. Grey Matters Productions chairman Bob Gunnell, is a member of the Older People’s Council and the founder manager of BBC Radio Brighton. Bob told us, “It can be difficult to get coverage of issues and activities affecting older people in the local media”. ‘At Home This Morning’ provides a much needed platform for these issues to be raised. Regular features include health tips from a doctor, safety tips from a local policeman and a monthly preview of the films and plays on show locally, plus regular reports from the Brighton and Hove Older People’s Council. The show also includes music, often linked in a slightly left-of-field way to the preceding spoken item. If you would like to talk to the production team about ideas for the show you can contact them at: athomethismorning@radioreverb.com .